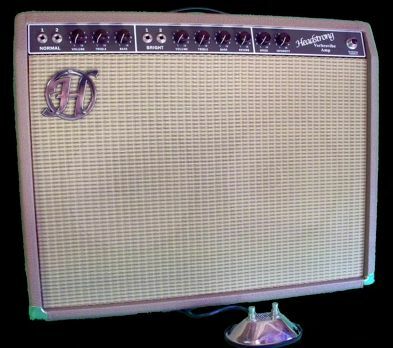 Verbrovibe, Modelling Combo Guitar Amp from Headstrong. Headstrong has released the first 3 Custom Shop Limited Edition Series amps: the Verbrovibe, the Royal Reverb and the Blue Lamp 112. These amps will be produced for the rest of 2012 in very small production runs of less than 25 each on a first come first served basis. The Verbrovibe is a reproduction of the 1963 Fender Vibroverb amp, the first Fender to feature on board reverb. At 35 watts this amp features a hand wired fiberboard, 2X10" Weber speakers, 2 channels, Reverb and bias Vary tremolo which modulates the bias from the power tubes to create the tremolo effect. It is housed in a solid pine finger jointed cabinet and covered in Brown Tolex with Wheat grill cloth. The Royal Reverb is another hand wired reproduction of the 1964 Deluxe Reverb combo. The amp features the same control panel layout as the original with Reverb and Opto based tremolo circuit typical of this era of amps. Housed in a solid pine finger jointed cabinet and covered in Black tolex with silver cloth the amp comes in at 22 watts with 2-6V6 power tubes through an Eminence speaker. The Blue Lamp 112 is a reproduction of the classic 1957-60 narrow panel Tweed Deluxe. Hand wired on a fiberboard like the originals this 5E3 circuit comes in at 18 watts and features 2- channels (normal and Bright) with 2 volumes controls and a master tone control knob. It features 2 inputs per channel (Hi and Lo). The handwired chassis is housed in a solid pine finger jointed cabinet and covered with lacquered cloth Tweed. It features a Weber 12A125 20 watt speaker. 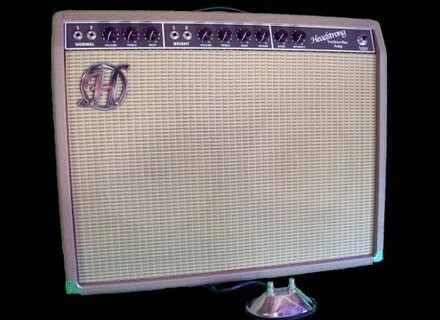 Check out Headstrong Amplifiers: www.headstrongamps.com. G&L ASAT Classic Alnico G&L introduces new ASAT Classic Alnico models. AlumiSonic 1100-Deluxe Aluminum Guitar AlumiSonic introduces its new Aluminum Guitar, the 1100-Deluxe. Carl Verheyen Electric Guitar Strings Dean Markley announces the release of the new Carl Verheyen Balanced Bridge Helix Electric strings.